If you want to get One Grip Higher, face the competition head on! This is truly brilliant marketing In my opinion, Netflix is in trouble. The recent debacle over raised prices for Netflix customers got national media attention. In the first week following the announcement the company lost 1 million customers. What did not gain national attention however was how Netflix responded to the consumer outrage. I personally recieved two emails from Netflix. The first was telling me how great the new rate plan was for me. 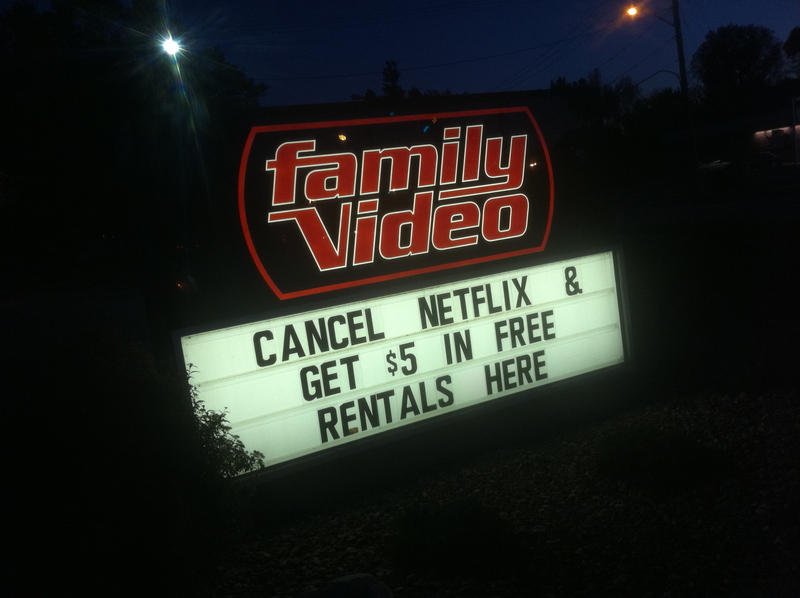 The second came a month or two later (irronically on the same day I saw the sign above) and it told me that Netflix was sorry for mishandling the roll out of the new prices. They still claimed however, that this was all in the best interest of me, the customer. Netflix handled this wrong from start to finish. They are wrong. The new plan is not in my best interest. The new plan is all about making money for Netflix… it is not about me. Netflix is not offering me solutions. Family Video has my attention. Family Video is offering a solution. They are taking their competition head on. They are (at least in appearance) working in my best interest. Take the competition head on… don’t back down. I cut my Netflix subscription in half… and am seriously contemplating canceling it altogether. Family Video is pulling me their direction. So, how about you… are you taking your competition head on? Are you offering solutions that are so daring, they might just get you recognized? If so, you will find yourself One Grip Higher.